Pennsylvania, the home of Dad’s Hat distillery, is a state that played a major part in the formative years of American whiskey, and the American government in general. Pennsylvanian farmers grew an awful lot of rye to make whisky in the late 1700′s, when the first Federal Government was being formed. What the Federal Government found was that they had a debt to manage, and the best way to manage the debt, was a tax on whiskey. It seems pretty strange in a way looking back, as it was George Washington’s Government that imposed this tax, and later, once he finished his second term, he became a whisky distiller himself. On the other hand, tax is unfortunately pretty essential to a functioning country (as someone who has recently done his tax return would say). When the farmers fought this tax, and there was a Whiskey Rebellion, Washington sent peace keepers to quell this rebellion, and negotiate with the farmers. This was the US governments first real test as to whether they could create a fair system, that supported the people, while imposing necessary taxes. Essentially booze is involved in most major historical events (and they never taught you that at school). The tax was repealed (although other taxes obviously appeared later) by Thomas Jefferson’s (you may have heard of him too) Republican party in 1801. Pennsylvania continued producing lots of rye, and a fair amount of whiskey (in spite of other pesky taxes) until the 1920′s when the Government got involved again, and imposed prohibition. Although there was most likely a fair bit of bootlegging, prohibition really damaged Pennsylvania’s whiskey business. Fast forward to early 2000′s, when the roots of craft distilling in PA started to grow, and then fast forward a bit further to Dad’s Hat in 2010, and we are pretty much up to date. 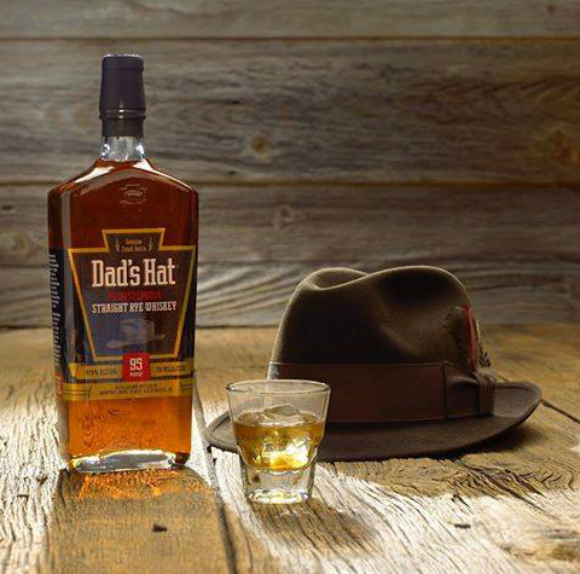 Formed in 2010, Dad’s Hat use locally produce rye to create some truly exciting whiskey (I haven’t tried the one in the cover photo above yet, it was just a cool bottle, but I have tried the one below). When I spotted it was getting imported to the UK, I instantly purchased a bottle, as I am always intrigued by distillers that are using small casks, unusual finishes, unusual mashbills. Life is too short to drink the same whiskey every day. The negative point I suppose, is that the bottle I purchased (for an Edinburgh University Water of Life Whisky Tasting) cost the best part of £51 quid. I imagine the costs of setting up, mixed in with the costs of beginning to export are the reasons behind the price. My excitement blinded me to the cost, but I reckon others may wince at this. I suspect though, as all of these small distillers get bigger, and get a bit more economy of scale, prices will level out. Nose: Sweet grape juice, blackcurrant syrup, lemon, bergamot, blood orange, honeysuckle, pears and apples. It’s fresh, vibrant and not too spirity. Palate: Lemon syrup, fruit and herbal tea. Blackcurrant notes, and a dash of barley spirit. The palate shows a little bit more youth, but the fruity notes from the vermouth, and the impact of the smaller casks, mean the flavours overpower the youthfulness. This will be really interesting to try as it gets older, and the fruity notes develop. While researching this whiskey, I learnt lots about American whiskey history, so £51.00 well spent. This entry was posted	on Sunday, May 3rd, 2015 at 1:28 pm	and is filed under Reviews. You can follow any responses to this entry through the RSS 2.0 feed. Responses are currently closed, but you can trackback from your own site.